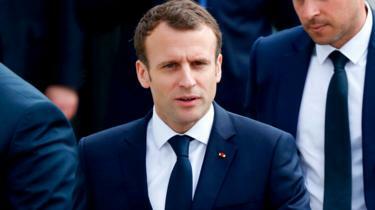 France's President Emmanuel Macron says he has "proof" that the Syrian government attacked the town of Douma with chemical weapons last weekend. He said he would decide "in due course" whether to respond with air strikes. Western states are thought to be preparing for missile strikes in response to the alleged attack. In Russia, Syria's main military ally, Kremlin spokesman Dmitry Peskov urged against "any steps which could lead to an escalation of tensions". US President Donald Trump, who said on Wednesday that missiles were "coming", has now tweeted that he "never said when".